~ Meat dipotong2 according to taste. ~ In a frying pan: boil coconut milk with spices are blended plus leaves and kandis acid. * 1kg of meat, coconut milk 3 eggs made thick, so if 1.5 kg should be 5 coconuts. - Sometimes there are people who say what if cooked rendang can not black like rendangnya Minang people. My mother said, so rendang can be black, the keys do not use turmeric. If you use saffron, let cook over low heat too long, rendang still looks red (as kalio). - In order dedaknya much, also have a lot of coconut milk. Squeeze the coconut milk for the rendang, the first juice should not be added dulu.Peras coconut water with a cloth / napkin particular, so that the starch out. 1 kg of meat, 4 coconuts (if in Batam = 2kg), 1 ounce chili grind. 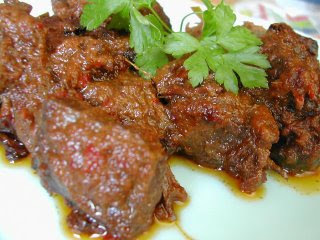 The size of cuts of meat fit for rendang, 1 kg = 25-30 pieces, cut to the fiber so as not to quickly destroyed when cooked. - If you type the faster the meat tender, do not be too quick inclusion, simply in the mix with herbs to seep in advance and aged k / l 1 / 2 hour, just enter after the coconut milk that has been dijerang out the oil.